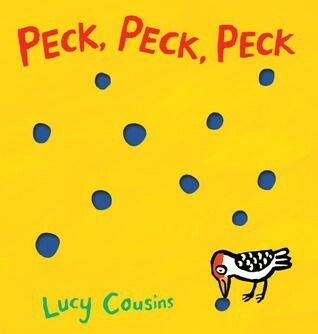 A wonderful picturebook full of holes about a woodpecker. A young woodpecker is taught how to peck and, once he starts, he can’t stop! Each turn of the page reveals a different setting, from the house to the garden, where holes are pecked into everything he finds. This amusing, rhyming story is a tactile treat. There’s lots to talk about and enjoy, including the many objects he riddles with holes and what the young learn from their parents. Read the story again and leave spaces for children to join in with the reading, especially the rhymes. When children hear the story again and again, they will get to know it really well and want to say it in their own words, using the pictures to help them. Listen for the ways they use words and phrases from the story. This confidence will help them to read the story independently. Children can use bird toys to act out the story (or make them out of playdough or plasticine). It’s a really good way for them to get to know the story well and helps to build their confidence with books. Using card, coloured pens and string or tape, children can make their own woodpecker mask, cutting holes for eyes, sticking on a pointy beak and attaching a band to hold the mask in place. Wearing their mask, children can flap from room to room, giving a running commentary on what they (pretend to) peck! Using lolly sticks, coloured pens, glue and card, children can make a stick puppet for the woodpeckers in the story. Click here for a woodpecker template. This is more fun if you join in, perhaps taking the role of the young woodpecker, with the child as the ‘wise woodpecker’ explaining how to do a variety of tasks in addition to making a hole. Cut a small hole in the middle of a piece of paper or card and move around the room viewing objects through the hole. What do children notice? Children can search the house for holes, recording them as a list, a series of quick drawings or photographs, eg plugholes, pipe holes, key holes, button holes, teapot spout… Are all holes round?